Fidel Castro is dead - but some American Christian missionaries to Cuba are very successful. This may come as a surprise. When Castro took over the island in 1958, he shuttered all of Cuba's churches, except a few in major cities. However, his younger brother, Raul, has been running the country since 2008. He has quietly allowed churches to open across the country. I learned about this over Thanksgiving when I chatted with Steve and Colleen Thoreson, who had such a successful missionary trip to Cuba last spring - that they have been invited back in February. He is the father of my daughter-in-law and she is a stepmother. Colleen became fluent in Spanish as a Peace Corps volunteer in Ecuador 50 years ago. "It's amazing that at age 75, the Lord would call us out," she told me. They began their missionary work in Africa when they were 65. They have a heart for missions. In Zambia they lived in tents for months at a time to minister to tribal people who had neither electricity nor running water. In Cuba Pastor Alejandro Frias, an Assistant Superintendent of the Assemblies of God in Camaguey, Cuba - heard of their work and invited them to meet with leaders of churches he supervised. 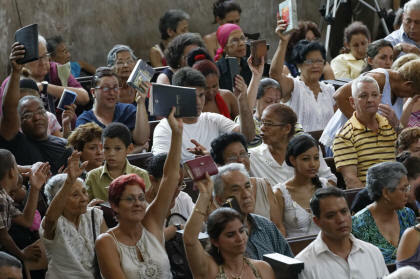 In Cuba foreign missionaries apply for a religious visa, but can stay only 30 days. The Thoresons flew from Miami to Camaguey, a city of 350,000 more than 100 miles from Havana. They conducted workshops in his Word of Life Church, and in nine rural churches, training 300 pastors and lay leaders. Result: an immediate 1,200 "salvations" of people who made a commitment to Christ. How was that possible? The Thoresons developed a "Gospel Script" which they trained church leaders to use. It begins with a "quick question: If you were to die today do you know beyond a shadow of doubt that you'd go to heaven?" If the response is "Yes," they respond: "Great. Why do you say `Yes?'" For many Cubans, this was not only good news, but exciting. They had never heard the Gospel presented so clearly. "Dear Lord Jesus, come into my heart. Forgive me from my sins. I believe you died for me and you rose again, and will some day come back to me, because I have Jesus in my heart." The Thoresons conducted ten trainings of pastors and church leaders at Pastor Frias' Word of Life Church. They then traveled with him to nine other villages, and gave 300 attendees a copy of the Script. Pastors and church leaders immediately went outside into the streets with a copy of the Script and conducted "Street Evangelism" with anyone they met and were instantly successful with many. Some 1,200 people accepted Christ within days. Pastor Frias had to add another service so that 300 new members could attend, and there was a similar impact in nine other smaller cities. "It was more than exciting to discover how easy it is to conduct one-on-one Street Evangelism," said Colleen. "Some young pastors got on fire and taught their whole church and congregations. All of the churches are increasing in size, because of what they have learned." Most American missionaries in Cuba are not using this Script. They lead Bible studies, teaching Scripture to Cuban pastors and leaders, which is helpful but does not have the profound impact of the Script. By contrast, Steve Thoreson says, "One-on-one street evangelism is getting salvation to people who are unchurched." In February, the Thoresons will return to hold a Youth Conference for Cuban high school and college students, and will train in additional churches. Who is funding the Thoreson's work? Only interested individuals. Cubans have no funds. If you would like a copy of the Script, or to make a contribution, write Christ for Cuba Ministries, Inc. 27010 67th Avenue East, Myakka City, Florida, 34251.